The automaker believes cars can only get you so far: the rest is up to personal mobility vehicles. At first glance, you may mistake the small circular machine at Ford’s Mobile World Congress booth for a Rumba. But you would be wrong. It's called the Carr-E, and is one of Ford’s prototypes for a future personal mobility vehicle. The Carr-E is the brainchild of Kilan Vas, a Ford systems engineer based in Cologne, Germany. 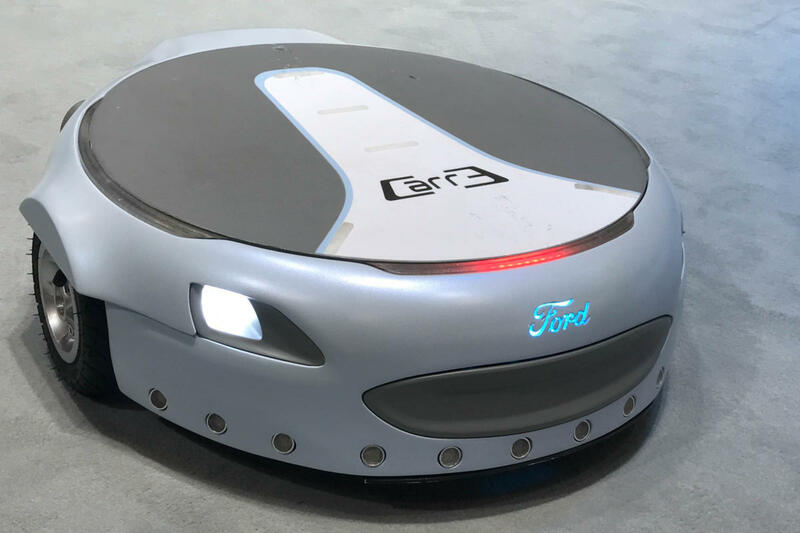 Vas built Carr-E as part of Ford's "Last Mile Mobility Challenge." The competition asked employees to come up with an electric prototype that would make commuting easier in places where a car is not permitted or impractical. Carr-E was one of the finalists. About the same size as a tire, Carr-E is meant to fit in the trunk of a car. It can carry a load of up to 120 kilograms at a max speed of 11km/hr and has a range of 22 kilometers, which should be plenty of juice to get you through the last leg of your journey. 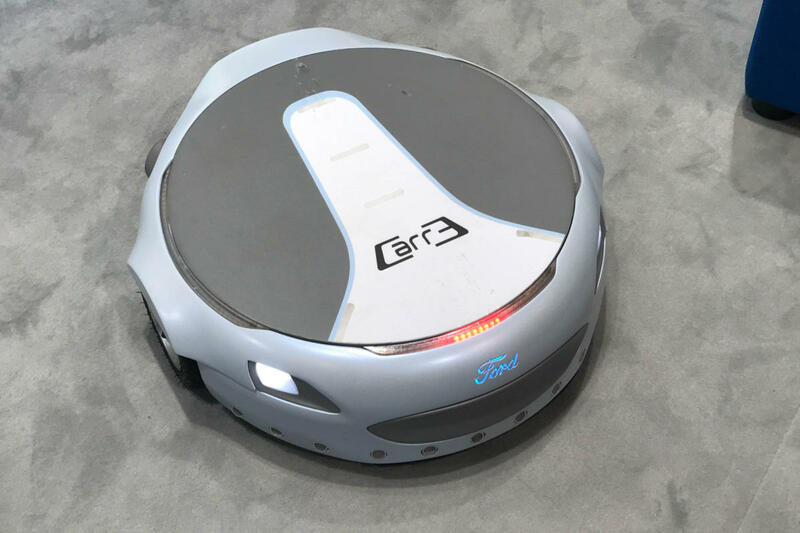 It's also possible to put Carr-E into "drone mode" and have it follow you around, something that might be useful when you have heavy luggage. Ford's Carr-E personal mobility prototype on display at the company's booth at Mobile World Congress in Barcelona on February 28, 2017. 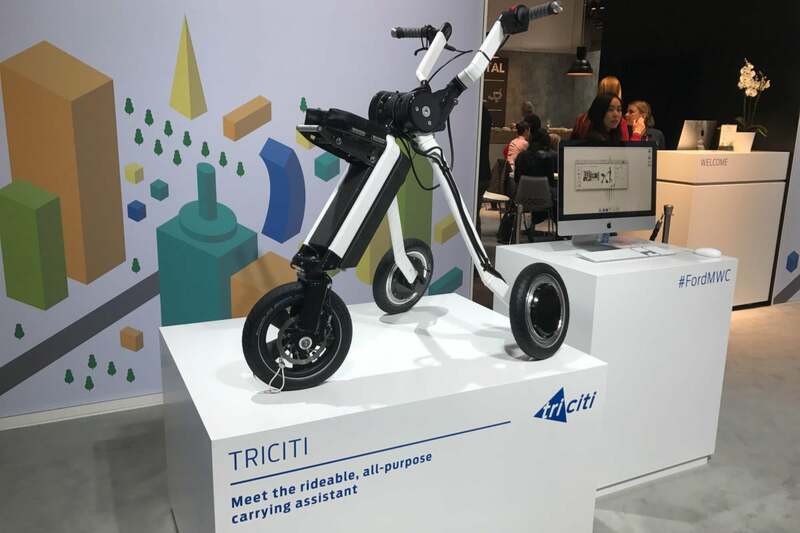 Also featured at Ford's "City of Tomorrow" booth was the TriCiti, a folding electric tricycle and another finalist of the Last Mile Mobility Challenge. Like Carr-E, TriCiti can also be ridden or used to carry goods. Ford's TriCiti personal mobility prototype on display at the company's booth at Mobile World Congress in Barcelona on February 28, 2017. But what garnered the most attention at Ford's booth is a demo the company called "Autolivery." Users were strapped into a VR headset and watched as a self-driving van and a drone worked together to deliver the last forgotten ingredient at a dinner party. Ford isn't the only carmaker trying to expand to last mile mobility solutions. At CES in January, we got a chance to test out Honda's self-balancing Uni-Cub, which will get you to your destination at about 6.4 kilometers per hour.